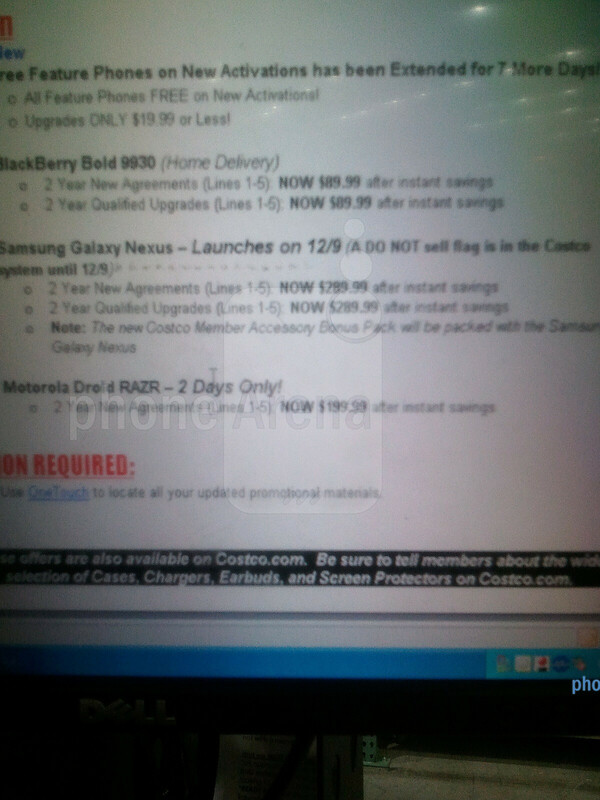 Thanks to a spy shot that was sent to us by a loyal reader, we now have more evidence to believe that Costco will offer the Samsung Galaxy Nexus for $289 on-contract – just the figure previous leaks were pointing at. What's more is that the retailer is bundling the smartphone with the so-called Costco Member Bonus Accessory Pack, yet which accessories the bundle will include is not quite clear. 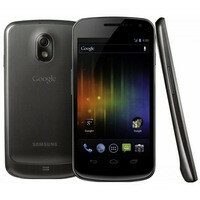 We should also point out that the spy shot clearly states a December 9 release date for the Samsung Galaxy Nexus, but before you get too excited, keep in mind that other sources suggest otherwise. After pointing at the very same December 9 release date for a while, the Verizon Equipment Guide now has the smartphone listed as “coming soon” hinting at a possible delay. And since that update was made just yesterday, the information in the spy shot might very well be outdated. Nevertheless, December 9 is just a day away, so it won't be long until we know for sure. It wouldn't hurt holding your fingers crossed, now, would it? Thanks goes to our anonymous tipster! This phone is not coming out tomorrow I called a couple weeks ago week of Dec 12th! Plus Google needs to step up their marketing have a press release day like samsung did when the sg2 was released in the US. I still don't know if this is all true simply because you would think if it was going to be released tomorrow that Verizon and/or Google would have confirmed it already. I'm about sick of this haha but unlike other people on this site and other sites, my mother taught me how to be patient. When it comes out, it comes out and I'll be there that day to pick it up. As for all these articles, I take them (as phonearena so commonly says) with a grain of salt. What? A voice of reason??? Kudos to you..
Yeah I mean I see all these people saying "oh this delay has made me not want this phone, I may as well wait for quad-core" blah blah. If you wait for quad-core, I guarantee youll be in the same boat. I promise that whatever the first quad-core phones are there will be delays. The thing people don't realize is that this website and others that give you hints about when phones are coming out and what they are, are just that, hints/rumors/leaks. People get mad at google at verizon, but why? It's not like verizon had commercials on tv saying "galaxy nexus will be out dec 8th" or google when they did their event said "this is the launch date". They said coming soon, they did that for a reason. People need to chill out, its awesome that we even can know what companies have in the pipeline for us, so instead of being ungrateful little internet trolls, just sit back and be happy. The nexus will be a fine phone, the best phone? nahh. I don't think it will ever be possible to make one phone to rule them all just because of the way technology advances and how quickly it becomes out of date. I hear what ur saying but I was actually at a Verizon Kiosk at a BJ's on Tuesday Dec.6th and I asked the sales rep if he knew the release date, he showed me the phone, told me he has ten of them...typed something in his computer and told me he can sell it on the Dec. 9th...I'm upset because I drove back bright and early like an A$$ just to find out he couldn't sell it today, and he doesn't know when he can...I just find it weird...they have the phones in stock so it can't be a testing issue, unless VZW says send them back...what is the hold up? The hold up is said to be the LTE outage, which is believable. I wouldn't want to run the gnex on 3g, its like running a Porsche on regular 87 grade gas. Honestly though, I feel that if it was truely because of the LTE outage, we should all not be surprised that it will be available thursday of this coming week if not sooner depending on how they wanna handle it. Personally I really don't care anymore. I'm up for an upgrade with Verizon and when I first heard about this phone I thought I'd try it. Well after all the false dates if it isn't out by then end of December I'm going with the I-phone. I work on pc's for a living go home and spend time on my home pc so it's really no big deal anymore with me. You need to get some patience and read the comments above..
Sure-These are phones anymore there small pc's(IMHO) Well I owrk in the IT dept. for a large media company and my co-workers were telling me about this phone even though many have laready purchased the I-phone and are under contract. So I decided to upgrade my three year old samsung rogue for a newer model smartphone-I mean IT techie gotta have the latest and greatest right? (LOL) Well after hearing the buzz about the phone it caught my interest but I'm thinking for a guy who works on pc's all day goes home to a pc and works does he really need this type of phone or just a plain no frills phone since really all I want to do is TALK!! but after playing with the I-phone I must say I'm impressed. I wish I could get my hands on a demo of this unit but my old samsung isn't going to last much longer-phone has reception issues so that's why I said what I did about pc's and release dates-Makes sense? Sorry for the typo's meant to say These Aren't phones anymore but pc's and I work for a large IT dept.